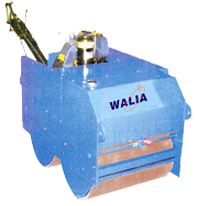 WALIA DOUBLE DRUM VIBRATORY ROAD ROLLER, Walk Behind Type, having Rolling Width of 750mm and Weight 1100kgs. Approximately. These Vibratory Rollers are Double Drum with Vibrations in Both Drums and an all Wheel Drive. These Rollers Employ the Double Vibratory Principle Providing Superior Compaction. The machine is most suitable for Road Widening Works, Pothole repairs, Rural Roads, Ideal for working in Trenches, for Compactions of Dry Lean Concrete etc. Centrifugal Force 2 x 1850 Kgs.